If you're constantly worried about balancing your bank account – comparing the money coming in and going out to make sure it all adds up – you're not alone. Nearly half of Americans currently live paycheck to paycheck, and most don't have more than $1,000 in savings. While studies have shown that admitting to financial difficulties can be embarrassing for some people, most Americans should be able to empathize with the struggle of having to pay for an unexpected expense or saving for a vacation. In fact, so many people have gone through these "tight" weeks or months waiting for their next paycheck that hashtags like #poor, #brokeAF, and #nomoney have become exceedingly popular on social media like Instagram and Twitter. So what posts are worth sharing your financial difficulties with the rest of the world? We examined over 2 million Instagram posts and tweets to see who's #broke and why. Keep reading to learn more. Depending on where in the U.S. you live, you might be more likely to post on social media about being #broke. People living in or visiting New York shared more #broke Instagram and Twitter posts than anywhere else in the country. Perhaps because of the rising cost of living in some of New York's biggest neighborhoods, the plethora of shopping opportunities, or even just the endless dining options, residents and tourists alike may have overstretched their budgets in the Empire State. Other states with higher volumes of #broke posts? Texas, California, and Florida. New York may have come out on top for the leading state for being #broke (including using the hashtags #nomoney and #brokemillennial) but Irvine, California, took the cake for the city with the most #broke posts. Where the average home might cost you over $700,000, and a standard one-bedroom apartment runs $2,000, it's no wonder people posting from this SoCal city may have their fair share of money problems. 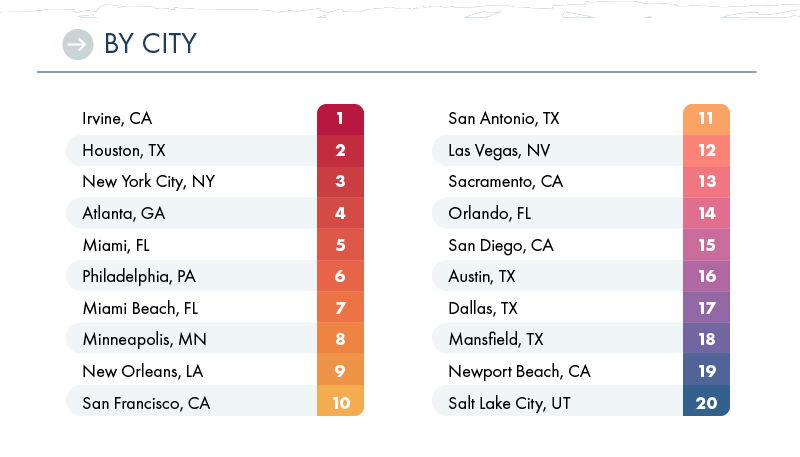 Other cities most likely to share #broke-related social media posts included Houston and New York City. So why are some people in certain cities more likely to be #broke? The answer might be hidden in the other hashtags featured in these posts. On Instagram and Twitter, the most common hashtag used in conjunction with money concerns, like #broke and #swimmingindebt, was #love. No one wants to end up in a dire financial situation, but sometimes people spend money with honorable intentions. You might already know how much dating costs, whether you're single or in a relationship. Between dining out, grabbing drinks, or even just getting from place to place, being in #love and being #broke are potentially two peas in a pod. You don't even have to spend money on someone else to feel good about purchasing something that might not be beneficial on the bank account. Research shows there really is something to retail therapy, even if those purchases aren't exactly in our best interest. 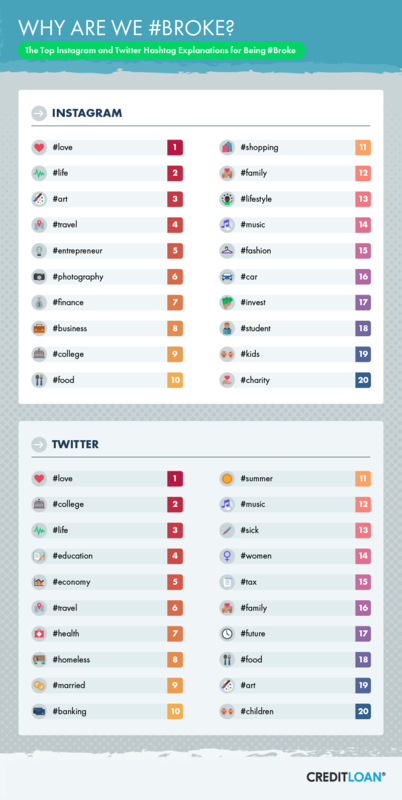 On Instagram, #life and #art showed up as popular tags associated with #broke, while #college, #life, and #education ranked in the top spots on Twitter. Across the U.S., student loan debt has exceeded $1 trillion (outranking credit card debt), and the cost of earning a degree is often shared between students and their parents alike. Regardless of why you might be #swimmingindebt, the odds are it probably doesn't feel so great. 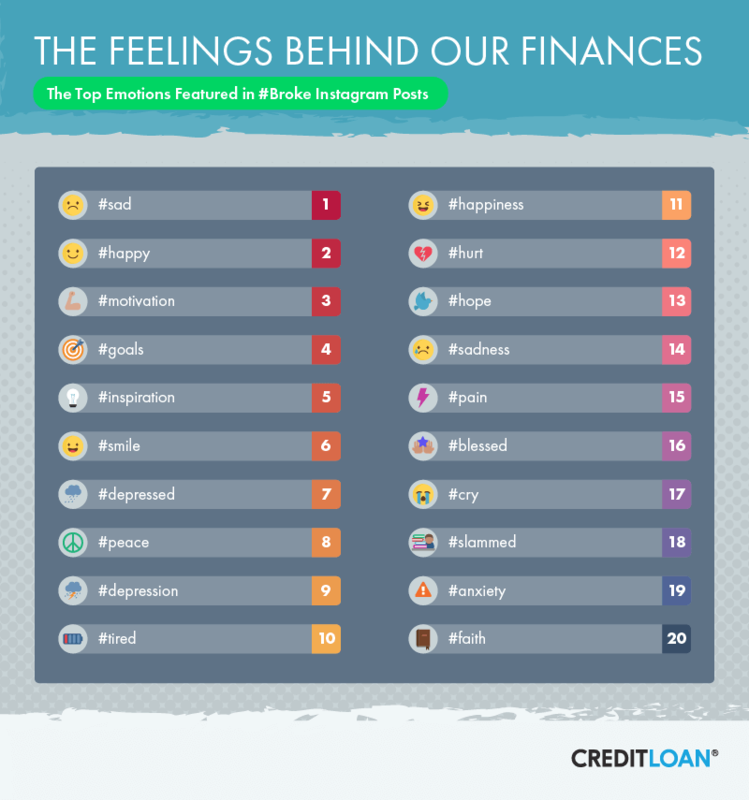 The most common emotion associated with #broke Instagram posts was #sad. The average American has a lot of debt (at least $15,000 in credit cards alone), and those financial problems can turn into mental and physical health problems as well. At least one study found that people with debt were more likely to experience mental health issues like anxiety and depression. Being #broke might also be hard to admit, even if we sometimes share the reality of our financial struggles on social media. Financial concerns aren't just personal issues – they can be political as well. When it comes to mixing bureaucracy and budgets online, we found the most popular hashtag was #Trump. President Trump's 2018 budget proposal included over $26 billion worth of reductions to federal programs, including millions in cuts to education, energy, and agriculture. 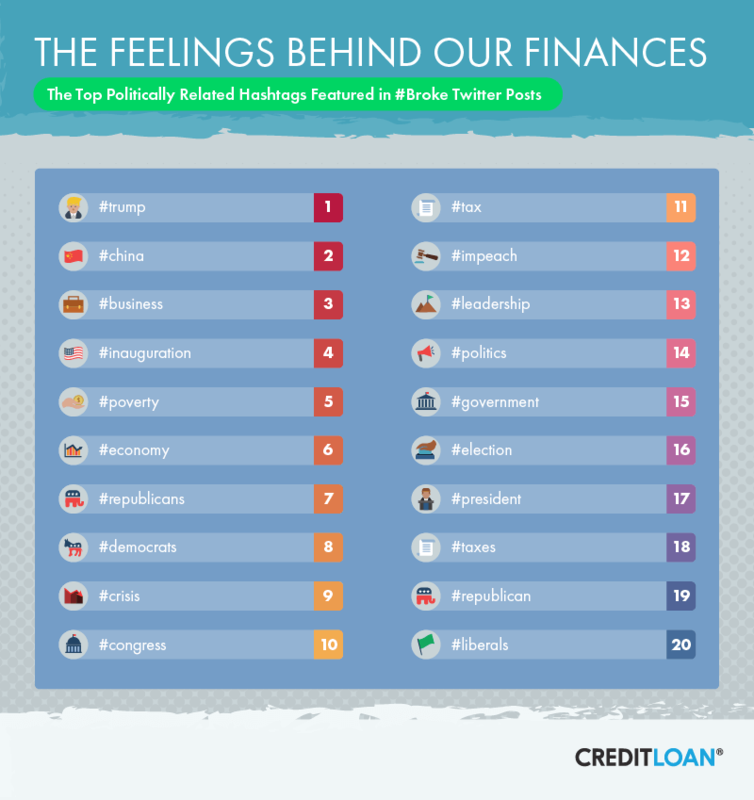 #China, #business, and #inauguration were also popular Twitter tags associated with #broke posts. As of May 2017, the U.S. was indebted to China to the tune of over $1.1 trillion –nearly a third of the country's total internationally owned debt. No Money, But a Wealth of "Likes"
While #broke turned out to be the most popular way to express financial troubles through social media, it might not be the best way to convince people to sympathize with your struggle. 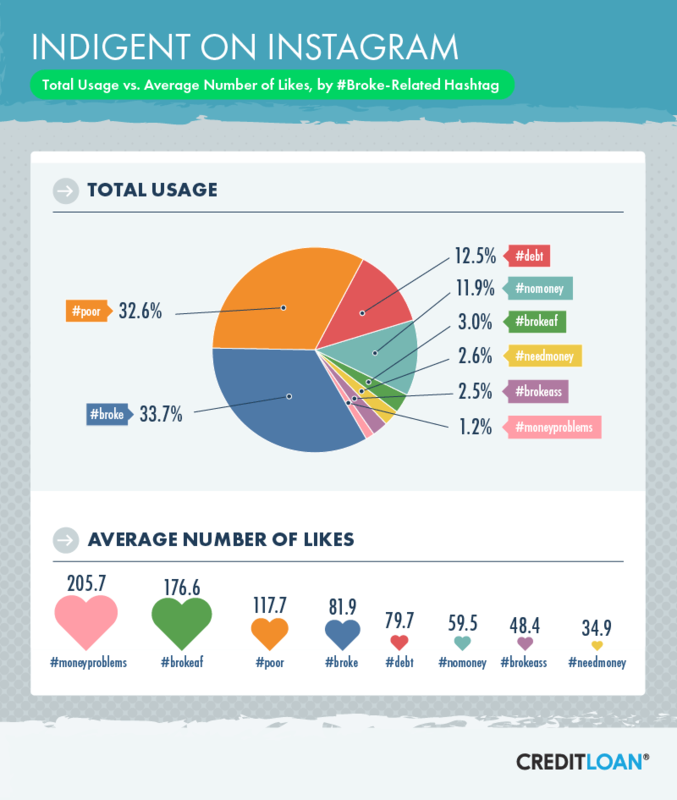 More than a third of the over 2 million Instagram and Twitter posts analyzed included the hashtag #broke but averaged less than 82 "likes." Likes might not help replenish your bank account, but #moneyproblems might be the way to go to garner some sympathy. Accounting for less than 2 percent of the total financially concerned posts studied, #moneyproblems earned nearly 206 likes on average. If you don't mind being slightly vulgar, #brokeAF might earn you almost 100 more likes than just plain #broke, and depending how much you want to share, #poor may make you wish you earned a dollar for every like on your posts or tweets – almost 118 on average. Even the best budgets aren't foolproof, and there are all sorts of subtle expenses that could be derailing your good spending habits. Our study of more than 2 million Instagram and Twitter posts tagged with money matters like #broke and #nomoney found people were more likely to post about their financial woes in the middle of the week rather than the weekends. For some, dining out regularly (including lunch, dinner, or both) during the week can add up to one of the biggest holes in the average American's budget. Between 2015 and 2016, Americans spent more money at restaurants and bars than they did on groceries – and all those tabs can start to add up big. 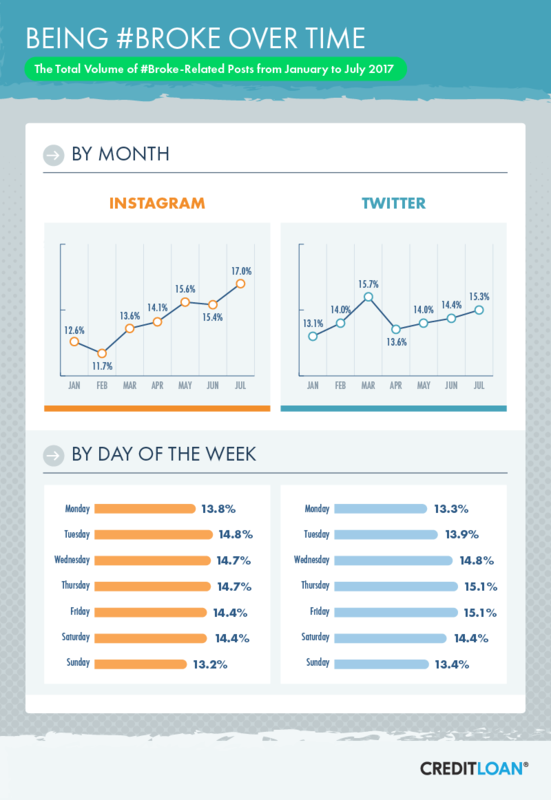 On Instagram, summer months were more popular for sharing posts tagged with money concerns, while March saw the highest peak on Twitter. In the spring, unexpected expenses such as home improvement renovations could be causing leaks in your bank account, while financial troubles in the summer months may be owed more to events like travel and weddings. When it comes to those epic summer vacations, it isn't always the bigger costs like hotels or airfare that break the bank. Expenses like boarding your pets, paying for family photos, or parking and tolls might be sneaking up on you, inspiring #broke tags on your vacation posts. At CreditLoan, we believe in providing solutions that work for your financial needs. By understanding how to maximize credit card reward options and maintaining a quality credit score, you can make your daily costs work for you and avoid being #broke yourself. (And if you are #broke, apply now for a bad credit personal loan). Reach your financial goals with the best in financial advice and solutions in one easy-to-access place. We collected over 700,000 Instagram and 1.3 million Twitter posts that contained the following hashtags: #broke, #poor, #debt, #nomoney, #brokeass, #brokeAF, #moneyproblems, and #needmoney posted between January 2017 and July 2017. Have you ever been light on funds but wanted to keep the social sharing going? If you would like to use any of the images, facts, and text above for noncommercial purposes, we grant you permission to do so. We only ask that you cite the author and link back to this page when you share.